Inefficient operational procurement processes can result in lost revenue opportunities and can significantly hamper your company's ability to remain competitive. Discover how to increase the efficiency and effectiveness of your procurement department by automating critical operational processes and enhancing supplier trade relationships. 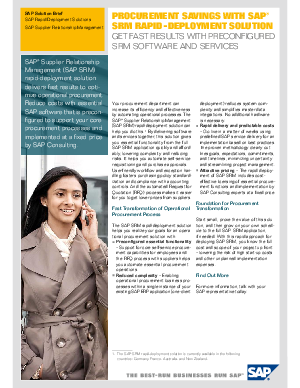 Read this white paper to learn how you can optimize operational procurement by lowering complexity and reducing risks with rapid deployment supplier relationship management (SRM) software.